Saw this on the news last night and I think this was pretty cool. Tennis stars Roger Federer and Andre Agassi played on a court 321 metres above the sea. 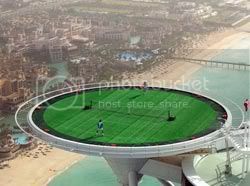 The two players knocked a ball around on the helipad of Dubai's Burj Al Arab hotel. The helipad was temporarily turned into a tennis court for the pair, who are in the United Arab Emirates to play in the Dubai Open. Then came the moment they must have dreaded - the ball went over the side. Could someone get that pls? - Tennis World No 1 Roger Federer after the ball went over the other side of the helipad of Burj Al Arab.